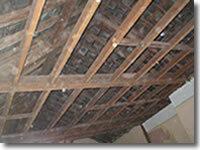 Woodworm Treatment - Furniture Beetle. Timber may be attacked by many different species of insects however the most common to be found in the UK is the Furniture Beetle. Most of the damage that is caused by the Furniture Beetle is by the Larvae which burrow through the wood over a period of several years before emerging as adult beetles. Woodworm Treatment Services formulate an insecticide spray to penetrate the timber to both prevent Larvae from pupating and young larvae from getting established. This is a highly effective solution.